Walking into the rehearsal space, I heard the glorious sound. It was the 48 singers in Lyric Theatre vocal ensemble practicing for its June shows and what a rich, full-bodied, and energetic sound it is! “Ensemble” is a keyword here because there is a world of difference between a group of people singing along, and trained and talented voices, such as those in the Lyric Theatre, singing together in multi-part harmonies. 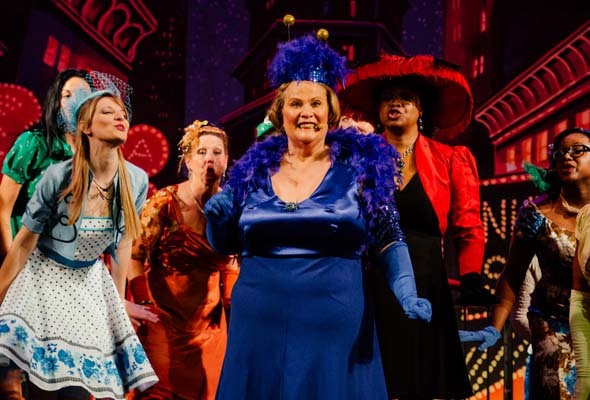 And then there is “theatre” – this is not a choir, but theatre music in various combinations, blocked and choreographed with costuming that entertains, Lyric Theatre president Louise Dorais says. And oh the repertoire: The tunes are some of the most loved and interesting in the vast Broadway library. As this is Lyric’s 25th anniversary, the group is preparing a special show, titled Back to Broadway. The 37 songs, selected by musical directors Bob Bachelor and Chris Barillaro, come from the imaginations of 26 composers and 23 shows. They include music from Chicago, the toe-tapping Hairspray and the irreverent The Book of Mormon, Beauty and the Beast and others. Older classics are George Gershwin’s My Romance and Cole Porter’s Blow Gabriel and Anything Goes. The show opens with songs from Mel Brooks’ hilarious The Producers. This year’s show is another musical review, and the co-directors build the show around who turns up to volunteer their talent and time. They participate in the Christmas show of songs that fits the holiday, and the directors can gauge the range of voices around which to build the Broadway show. This year’s show has a strong male contingent. Among the six musicians who will be on stage is pianist Guillaume Martineau, who also plays jazz at Upstairs Bar & Grill. As always with musical theatre, they note the audience is not just coming to hear the music but the story as well. Back to Broadway is performed at the DB Clarke Theatre of Concordia University, 1255 de Maisonneuve Blvd., June 11, 12, and 13 at 8pm, with a matinee June 13 at 2pm. Be the first to comment on "Lyric Theatre set to wow with glorious Broadway revival"